PLYMOUTH -- Inside the stately Court Street headquarters of the Old Colony Club, a large moose head keeps watch over the front stairwell. 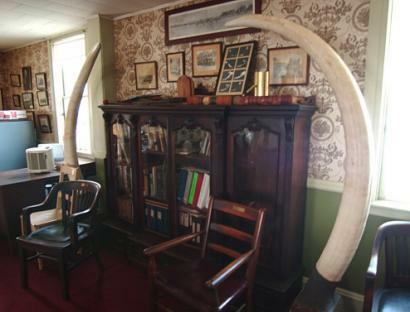 Six-foot-long African elephant tusks are on display in the billiards room. On the main parlor wall hang photographs of past presidents of one of the oldest men's clubs in the country. If the decor is not enough to set the place apart, the official club headwear -- Abraham Lincoln-style top hats -- probably is. Members congregate at the club on Friday nights to puff on cigars, shoot pool, play cards, tell jokes, and mix cocktails at the bar in the back of the house, in a converted butler's pantry that they call the snug, a Britishism. The private men's club, a well-known institution in Plymouth, is just one of many colorful social clubs that quietly thrive in the suburbs south of Boston. There are little-known local branches of national fraternal organizations such as The Improved Order of Red Men, The Mystic Order of the Veiled Prophets of the Enchanted Realm, Knights of Pythias, and the less flashy National Grange of the Patrons of Husbandry. You can also find the likes of the Portuguese National Club, which was founded in Stoughton in 1934, and is still based there today. Some clubs are for men only; others are coed. Some use secret initiation ceremonies and superlative titles. Elks leaders are known as "Grand Exalted Rulers." Masonic leaders are called "Worshipful rand Masters." Across the country, memberships in such organizations has declined in recent years, but some local groups maintain sizable rosters. Membership in the Old Colony Club actually has picked up over the past few years, according to club president Bernie Sampson. The Old Colony Club was established in 1769 by seven young Plymouth men who wanted to avoid "the many disadvantages and inconveniences that arise from intermixing with the company at the taverns in this town of Plymouth." The Court Street house has served as the club's headquarters since 1893. Only members have keys to get inside, and candidates for membership must be sponsored by a current member. "The club is a place for us to go on Friday night and relax after work, and decompress from the week," said Sampson, 60. The Old Colony Club has about 140 members, and it's not just old white guys. Members range in age from their early 20s to their late 90s. Curtis Chin, 25, was introduced to the club by his girlfriend's father, and recently joined its ranks. On the Fourth of July, he wore a black top hat and dress clothes, just like his older counterparts. "It's a great club," Chin said. "Everyone here is welcoming to everybody. There's no pressure." Among the Old Colony Club's traditions: Every year on Dec. 22 -- Forefathers Day -- members wear their trademark top hats and march through downtown Plymouth before daybreak to commemorate the Pilgrims landing at Plymouth Rock. Then they retreat to the clubhouse for a succotash dinner. During the summer, they go to Clark's Island, where the members "refresh ourselves from the arduous journey with ales and lagers, but we steadfastly refuse to break our traditional fast until after the conclusion of certain ancient and secret rites," according to oldcolonyclub.org. But ask most club members what the Old Colony Club is about, and they'll say it simply provides a clubhouse in which to hang out. The Old Colony Club's jacket-and-tie dress code may seem formal, but other organizations have more elaborate attire. Masons, for example, wear embroidered aprons with fringe and tassels; collars of royal-blue velvet adorned with gold-plated designs; jewels shaped like stars, triangles, and crosses; and white gloves. Masonic rituals involve marches, altars, pillars, globes, gongs, and swords. There are 36 Masonic lodges in Boston's southern suburbs. Lodge rooms are modeled after the biblical descriptions of King Solomon's Temple. Freemasonry is not a secret society, but a "society with secrets," according to the Grand Lodge of Masons in Massachusetts. "A secret society! Isn't that awful?" Brockton resident John Deitrick Jr. said sarcastically. He has been involved in Freemasonry since 1965, and energetically defends the organization. "You think it's a secret society, walk into any library and you'll find all kinds of books on Masonry." Sure, Freemasons use special handshakes, he said . " We do it to tease ourselves, and it's a form of recognition." The real secret, if anything, is the amount of charity they do, he said: "We give back to society, on a daily basis." The Shriners Hospitals for Children are funded by a Masonic organization known as The Shrine. Although Shriners are well known, their background is less so. The club was founded in 1872 as the Imperial Council of the Ancient Arabic Order of the Nobles of the Mystic Shrine. An actor and a physician in Manhattan came up with that lengthy name, devised the rituals of the club, and decided that members should wear a red fez with a black tassel. He also decided The Shriners should use Arabic-inspired salutations, such as "Es selamu aleikum," which means "Peace be with you." The official Shrine emblem, the Jewel of the Order, is a crescent and star hanging from a curved sword. Only Master Masons can become Shriners; leaders are called "potentates." The Mystic Order of the Veiled Prophets of the Enchanted Realm is another Masonic organization, with chapters known as grottoes. Each member is known as a Prophet. There are grottoes located in Brockton, Dedham, and Quincy. Richard Cusick has been a Mason for 22 years, and also belongs to the Mystic Order of the Veiled Prophets of the Enchanted Realm. As the district deputy grand master for the 17th Masonic District, he oversees eight Masonic lodges in Brockton, Bridgewater, East Bridgewater, and West Bridgewater, each with an average of 200 members. "The fraternity is coming really strong now," he said. Until recently, Masons did not actively recruit members, Cusick said. "So unless you knew a Mason in your family, you didn't know that much about us." Then, four years ago, the Grand Lodge of Masons in Massachusetts hired a public relations specialist and launched a website -- massfreemasonry.org . They started holding annual open houses, and in 2005 the Plymouth Masonic Lodge opened one of its ceremonies to the public. More than 200 people attended the inauguration of Plymouth Masonic Lodge master Daniel "Butch" Machado. The next statewide open house will be held Oct. 13. The message is that the Masons have nothing to hide. "We have devoted $3 million a day throughout the world to charity," Cusick said. "You give of yourself, and expect nothing in return. "We're very proud of what we do."